The holy grail for exoplanet science would be to find an inhabited planet. Not just habitable, but actually inhabited. But where are we most likely to find those planets? Only around Sun-like stars, or could life thrive around other types of stars? Could evolved stars like white dwarfs or neutron stars support life? Could brown dwarfs, the so-called failed stars, have inhabited planets? Many people have studied (and many astrobiters have written about) the possibility for life in a variety of systems: see Courtney’s astrobite for habitability of free-floating planets, Sukrit’s for how dark matter may affect habitability, Lauren’s for habitability around a binary star, and one of mine for a study of how your place in the galaxy may affect habitability. 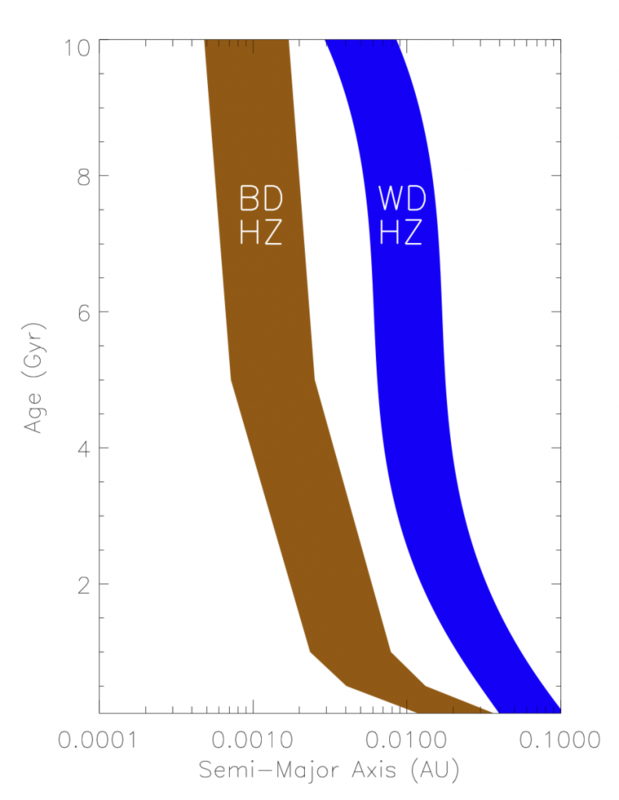 The "insolation habitable zone" for a 40 Jupiter mass brown dwarf (brown) and a 0.06 solar mass white dwarf (blue). The habitable zone is much closer to the star than for a Sun-like star (1AU). This study targets in particular white dwarfs and brown dwarfs; their names are deceptively similar but the objects themselves are quite different. White dwarfs are the remnants of Sun-like stars after they expand to red giants and then lose most of the hydrogen and helium envelope, leaving a cooling degenerate core of carbon and oxygen. Brown dwarfs are objects that form like stars out of a giant cloud of gas, but never become hot enough to fuse hydrogen in their cores. What these dwarfs have in common is that they cool over time, very much unlike main sequence stars which have a roughly constant luminosity for billions of years. This continuous cooling could be perilous to the development of life on orbiting planets. Even if we find a planet which is actually within the “insolation habitable zone”—the range of orbits where a planet could have liquid water on the surface—the planet would have been significantly hotter just a few short (hundreds of millions of) years prior. When planets get hot enough, all the water evaporates into a gas. The big problem is that once all the water has evaporated into the atmosphere, it’s very easy for the planet to lose it completely to space. UV photons (the same ones that give you a sunburn) have enough energy to dissociate water into H and O atoms; since H is very light, it is easy for it to escape from the atmosphere. One this happens, this process leaves behind a planet like Venus, with a CO2-dominated atmosphere and no water. Even once the planet cools off to a temperature where water would condense, making the planet “habitable,” there’s no water left to condense! The situation is particularly dire for planets orbiting white dwarfs, because white dwarfs start out with surface temperatures of tens of thousands of degrees! This means that they emit a large number of these higher-energy particles that can dissociate water (recall Wien’s law for blackbody radiation). Even if we find a planet orbiting a white dwarf in an orbit that currently appears habitable, it’s almost certainly lost all its water already, during a phase when the white dwarf was hot enough for all the water to be gaseous. This means that it could actually never harbor life, no matter how long it stays in the habitable zone after this point! For brown dwarfs, the situation is less clear; they emit very little UV radiation in their normal spectra since they’re quite cool (< ~2500 K), so planets around them won’t lose their water vapor as quickly as planets around white dwarfs. However, much like stars, brown dwarfs may be active and flare, especially early in their lives. This activity, for stars, releases large amounts of UV radiation. But we don’t know how active brown dwarfs actually are, because few young, active brown dwarfs have been well-characterized! To understand potential habitability of planets around them, we’ll need to know more about their infant lives. The Earth also suffers with the same theoretical issue re. loss of water in the early stages of the solar system. Hence the need for the late veneer theory of water-bearing cometary impacts. Yet, the Earth is blessed with oceans. Likewise, a sizeable moon of a brown dwarf system is likely to regain water later on from cometary impacts within the BD system, or from without. The surprising abundance of water throughout our own system should give pause for thought before prematurely discarding the potential for life in much smaller systems which, lacking the harmful top-end radiation emission of a powerful star, may be surprisingly conducive to life.